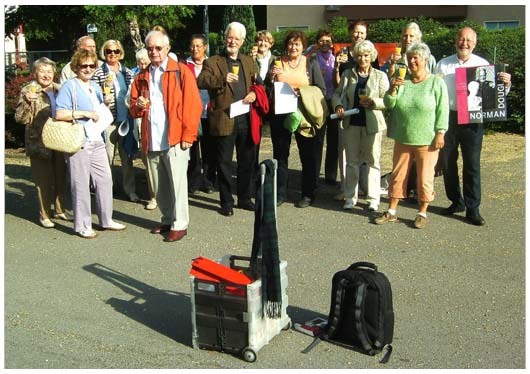 It’s Saturday May 21st and the first photo shows the Austro-British Society getting ready to set off on their annual excursion with a now traditional glass of prosecco. As can be seen from Andrew’s poster and travelling library, we were following haunts of the Scottish Travel author Norman Douglas.By opening a textile factory John Douglas, Norman’s grandfather, had brought employment to Thüringen in Vorarlberg. Villa Falkenhorst in Thüringen, Norman’s childhood home, was our goal. Andrew was whetting our appetite with readings and stories about Norman during the journey bu,t before reaching Villa Falkenhorst, a break was taken for coffee and necessities at an unusual venue: supporting Tyrol before crossing the Arlberg Pass, we stopped at the cafe in MPreis in St. Jakob am Arlberg. On arrival at Villa Falkenhorst, promptly at 11am, we were received by the manager Mr. Winsauer and Dr. Meusburger of the Norman Douglas research centre. In the grounds of the villa Dr. Meusburger spent a good hour of his time talking to us about Norman’s life and work. It was fascinating listening to him. How enthralled we were can easily be seen on our faces. For his kindness, a bottle of special Tiroler Schnaps from Axams was presented to Dr. Meusburger. To our great surprise he, himself, gave Andrew a book of Norman Douglas photographs. What Andrew and Horst are doing with the book I am really not certain. We were very happy to have been able to have time at the villa but we also gained the impression that the villa was just as pleased to receive us. Before looking around the inside of this lovely house, we were able to help ourselves from a table of drinks, savouries and small cakes, so thoughtfully provided for us. Our next pictures show us listening, this time to Andrew, at Blumenegg. If we look tired it may have been because it was after lunch or because of the efforts Andrew, Dieter and Hildegard had gone to in finding the path. I myself was as taken by the “botanical narrative” of this delightful venue, as Norman Douglas was. From the grounds of the villa we were able to look down towards Bludesch where young Norman had walked all the way to school with his brother. The school was easily found. Besides, we had a photo to help us. 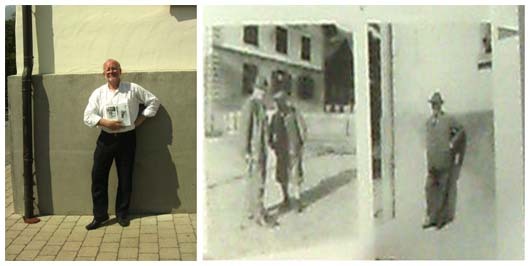 Andrew is shown in exactly the same spot as Norman in the picture in Dr. Meusburger’s book. Even the drainpipe is the same! 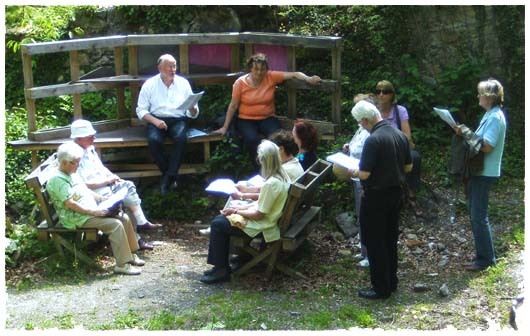 In the writings of Norman Douglas we also hear about the old church of St. Nikolaus in Bludesch. That, too, we found and what a little jewel it was, with its walls still covered in the remains of 14th century frescos of the Last Judgement. Again we were in luck. An 83-year-old man from a few houses away had just been filling the box at the church with leaflets about this 900-year-old building. He said that, if we’ve got 5 minutes, he’d tell us about the church. It was a very long 5 minutes for us, sitting on hard benches while he stood and talked, but worth it as he told us more than just about the church. By then the rain had started and it was time to leave Vorarlberg, with our minds full of very interesting memories. A last stop to reminisce over the day was made for coffee, in Langen am Arlberg and then, tired but happy, we returned to Innsbruck. Even the travelling library slept on the way home!